Since fledging in mid July, Cealtra, the 2015 young female White-tailed Sea Eagle has been gradually finding her wings. As you probably know she is one of 4 sea eagle chicks fledged this year from nests in the wild in Clare, Kerry and Galway (sadly a 5th hatched at Glengarriff in west Cork didn’t make it). All 4 chicks are now flying about and gaining much needed experience of their environment while still, in most cases, being pretty much dependent on their parents for food. The last fledged chick (in south Kerry) has yet to leave the nest area, happily hanging out in the beautiful glen she hatched in while her parents return every now and then with food. 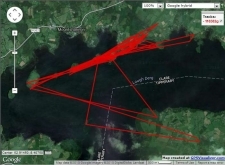 Over the coming months look out for updates on Cealtra's progress as she explores more and more of Lough Derg, and wherever the fancy takes her. More in this category: « White-tailed Sea Eagle chicks take to the wing!